The Justice Foundation is committed to giving back to our community through fundraising events and charitable contributions to organizations that serve the underprivileged, the underrepresented and the cause of justice. 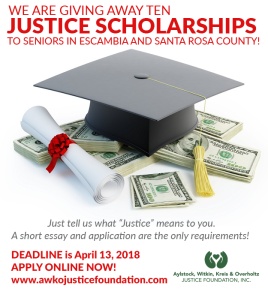 The Aylstock, Witkin, Kreis & Overholtz Justice Foundation will be giving away TEN “Justice Scholarships” valued at a minimum of $1,000 to high school seniors in Escambia and Santa Rosa County, Florida. The application is open to ALL seniors from public and private high schools in both counties. The application deadline is April 12, 2019. 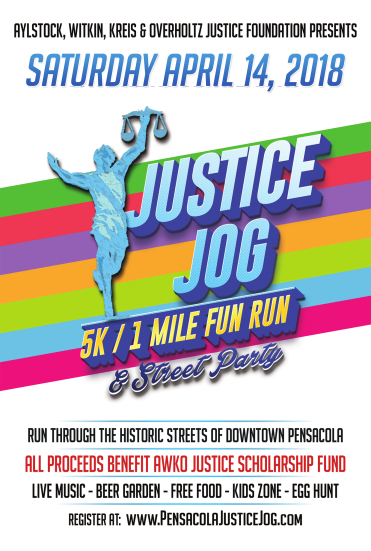 Join us Saturday, April 13, 2019 and run through the historic streets of Downtown Pensacola. 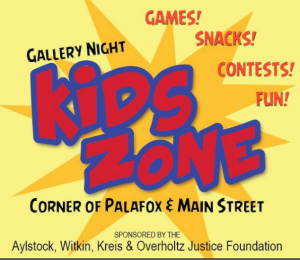 Following the race we will host a family friendly street party! Join us for the free Budweiser Beer Garden, complimentary food tastings from local restaurants, a Kids Zone & so much more! 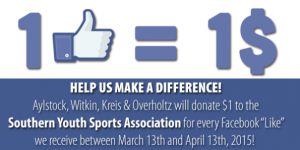 The Aylstock, Witkin, Kreis & Overholtz Justice Foundation was created to respond to financial needs in our community. that serve the underprivileged, the underrepresented and the cause of justice.